Who do you support in the Mercedes-Benz Tweet Race? Check it out folks. 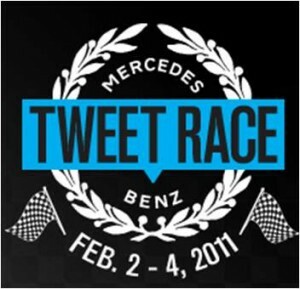 Mercedes-Benz is hosting a Tweet Race alongside this year’s Super Bowl and YOU get to participate! Beginning Wednesday February 2 and converging on Friday February 4 at Cowboys Stadium outside Dallas, Texas where Super Bowl XLV is being played on Sunday February 6, “Four two-person driving teams behind the wheels of specially equipped 2011 Mercedes-Benz vehicles, each embarking separately from Chicago, Los Angeles, New York City, and Tampa…” will race to Dallas, Texas for a chance to win a pair (one for each of the drivers) of all new 2012 Mercedes-Benz C-Class Coupes. But this is no ordinary race. This race will be fueled by Twitter and each driving team has been assigned a celebrity coach that represents a charity. The winning team will not only receive the pair of C-Class Coupes for the drivers but also a cash donation to the charity represented by the celebrity coach. Scroll down and click on “Team GL”, “Team E”, “Team CL, or “Team S”. We are supporting Team GL. See below. Now select ‘Join Team’, enter your information, and click ‘Submit’. Remember to also tell your friends about the race and who you support by sending them a link to our post. As we looked through the four race teams we took a few factors into consideration when determining who to support. First and foremost (we joke) we absolutely CANNOT support a team partnered with Yankees Outfielder Nick Swisher. AutoConverse.com is powered by the advertising firm AutoConversion of Philadelphia, a city still reeling from its loss to the Yankees in the World Series last season… 😉 With Team E out of the running, we reviewed each of the 3 remaining race teams to see who the participants were and what charity they represent. In the end, we chose TEAM GL. 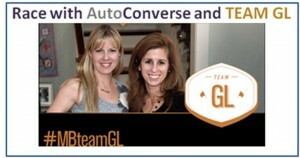 Team GL is made up of two moms, Jennifer Marshall and Co-Driver Meredith Sinclair. Both Jennifer & Meredith are everyday women who are using Twitter to make a difference in people’s lives. We applaud them and want to do everything we can to help them win the Mercedes-Benz Tweet Race! Serena Williams is Team GL’s Celebrity Coach. Williams represents her ow foundation, the Serena Williams Foundation. The race starts on Wednesday February 2, 2011. From now until the race ends on Friday February 4, 2011, Team GL team members (you and us) need to follow Team Captain Jennifer Marshall @nuckingfutsmama and Co-Driver Meredith Sinclair @Hoo_dee_Hoo on Twitter. During the race you will want to tweet as much as possible using Team GL’s hashtag: #MBteamGL. Let’s make it happen for Jennifer and Meredith! We think the Mercedes-Benz Tweet Race is an excellent use of technology by Mercedes-Benz and we want to show our support by getting our tribe behind the race. In order to keep everyone updated with the latest TEAM GL happenings we will be posting regular Tweet Race updates on the our Facebook page and on our Twitter profile @autoconverse. Follow us and remember to join TEAM GL on Facebook too. 1 Comment on "Who do you support in the Mercedes-Benz Tweet Race?"